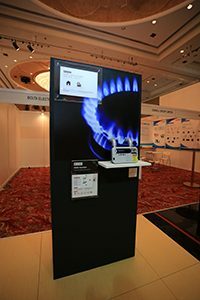 EDMI’s innovative technology was once again on show at this year’s Asian Utility Week, held in Kuala Lumpur, Malaysia, on 5th and 6th August. 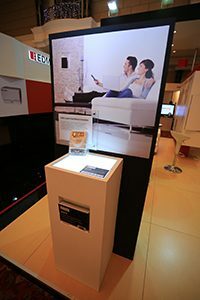 The highlights of the display included the Papillon Series, single phase Mk31E: the smart electricity meter for cost-effective residential AMI rollouts in Asia, and the Helios Series Ultrasonic G6000 gas meter: a powerful new gas solution for the Asian market. Ong Kok Hua, EDMI’s Communications Design Manager, brought it all together as EDMI’s event speaker, laying out EDMI’s product vision for smart communications. International guests attended the exhibit to learn more about the future of technology in Asia’s energy sector. 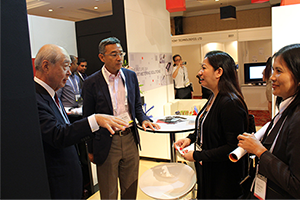 EDMI’s Asia Pacific customers were able to visit the booth and engage with OSAKI’s Chairman, Yoshihide Watanabe. The booth itself took on a new look and feel for this year, with EDMI partnering with communication business partners Telit, Trilliant, Silver Spring Networks and On-Ramp Wireless to deliver reciprocal displays: our meters in their booths, their branding in ours. The two-day conference was a great success, providing valuable opportunities to both EDMI and our partners to shape a positive future of the Asian energy industry.